The presence of a long line of active, dormant, or even extinct volcanoes all along the west coast of the USA is responsible for the large number of natural hot springs found in the country. The geothermal waters that seep, trickle, or flow from below the surface of the Earth all along this line of volcanic activity are rich in minerals that are thought to have health-giving properties and have attracted people with various ailments for hundreds of years. Since 1860, the Glen Ivy Hot Springs in the Santa Ana Mountains have been attracting thousands of health enthusiasts to come and relax in one of nature’s greatest gifts, the naturally occurring hot mineral springs. When you visit Glen Ivy today you will step into one of America’s largest health spas, which can boast no less than 19 thermal pools and offers a full range of associated spa treatments and experiences. You can get hot and sweaty in one of the brand new saunas and try a cleansing red clay mud treatment, a relaxing massage, or a soothing facial. The resort is spread over a large scenic area and offers delicious healthy cuisine to complement your hot spring experience. Visitors to Las Vegas can escape the glitz and glamour for a few hours and head off 6 miles northwest of the city to find the Montezuma Hot Springs, which have been revered for hundreds of years for their mineral-rich healing powers. The naturally hot bubbling waters have been dammed into a series of cement pools of varying sizes and temperatures, set along the scenic Gallinas River, in close proximity to several historic buildings, which you can admire after your soak in the pools. The Lobster Pot and the Africa Pool are two fiery natural rock pools for the brave. 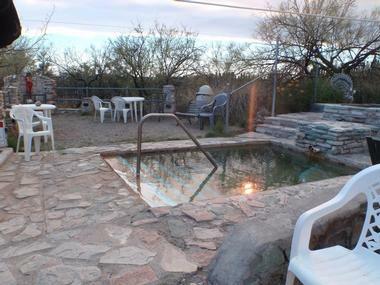 Located and maintained on private property belonging to the United World College, entrance to these great hot springs is free of charge. 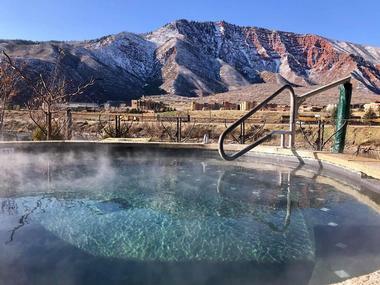 Iron Mountain Hot Springs is a newly-opened mineral springs spa and resort in Glenwood Springs, opened to the public in 2015 by couples Jeanne and Steve Beckley and Coop and Mogli Cooper. 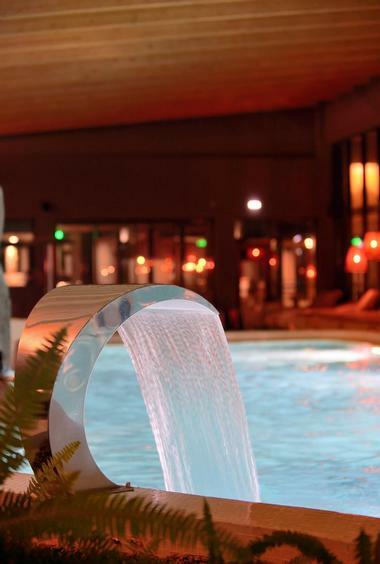 The facility, which is open to the public daily between 9:00am and 10:00pm, is home to relaxing and invigorating pool and spa areas with waters rich with more than 14 minerals, including sulfate and iron, which are known for their relaxing, healing properties. A large family pool pumps 100,000 gallons of water, while 16 smaller pools are connected by heated walkways. An onsite bathhouse is also offered, along with the casual Sopris Cafe, which served up wrap sandwiches and flatbread pizzas. Rumored to be the Fountain of Youth famously sought by the Ponce de Lyon back in the 1500s, Warm Mineral Springs is a little-known natural thermal pool located close to North Port in Florida. The springs have an interesting history and archaeological evidence has been found that suggests that the pool was known to ancient civilizations, which regarded it as a sacred site and buried their dead around the edges of the pool. Today visitors can spend a few hours soaking up the health-giving properties of the 85-degree waters in an attractive park-like area and avail themselves of a variety of pre-bookable spa treatments. The Deep Creek Hot Springs are nestled at the base of a deep crevice in the San Bernardino National Forest near the town of Apple Valley. You can reach the springs via a fairly short 2.5-mile hiking trail from Bowen Ranch, which drops quite steeply to reach Deep Creek – consequently you need to be prepared for a strenuous hike back up to the trailhead. Once you cross Deep Creek you will find about five or six differing hot pools to try – the temperature of the water varies from pool to pool and can be anything from pleasantly warm to really hot. 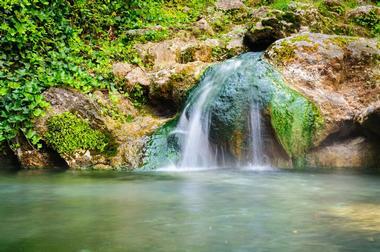 If you need to cool off, you can hop into the chilly waters of the creek. Bring plenty of drinking water and sunscreen. 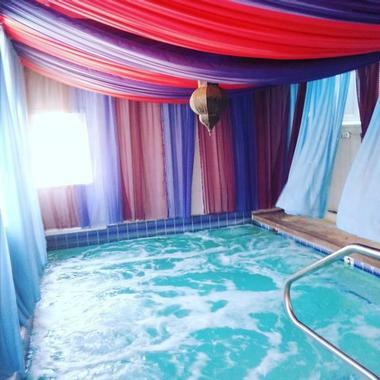 Located just east of Death Valley National Park and about 80 miles from Las Vegas, Nevada, the Tecopa Hot Springs Resort offers an affordable opportunity to enjoy the healing mineral waters of the Tecopa Hot Springs. The resort has a number of options for overnight accommodation – you can rent a cabin, lodge room, or campsite, all of which will entitle you to enjoy the mineralized hot tubs at no extra cost. 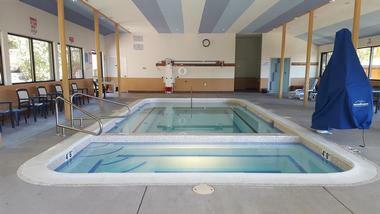 There are a total of five private soaking tubs available on a first-come first-served basis; the resort pumps the natural thermal waters into these tubs, located in the bath house or the motel, so that you can enjoy their restorative properties in private. The Tuscan Springs Hotel and Spa is located in Desert Hot Springs, north of Palm Springs, and offers a delightful Tuscan-themed boutique hotel where guests can enjoy relaxation, pampering, and soaking in natural thermal waters. Residents at the hotel can spend an hour or two in one of the two Jacuzzis, which are fed by natural volcanically heated water at 117 degrees, or opt to soak up the minerals in the large thermally heated pool, which is kept at a perfect temperature. 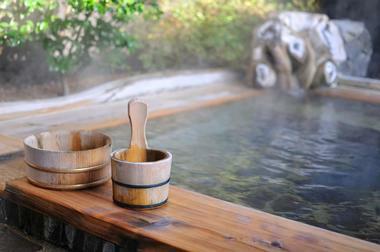 You can select from a long list of spa treatments to enhance your hot spring experience. The resort also caters to day visitors and you are welcome to come and enjoy the waters if you are passing by – booking is recommended. 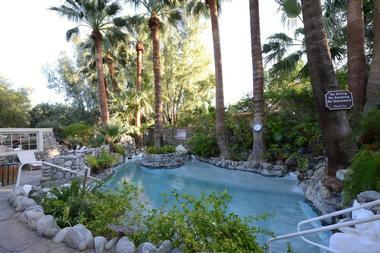 The Spring Resort and Day Spa is located in the town of Desert Hot Springs and offers visitors a relaxing place to enjoy a famous Californian hot springs experience. Upon arrival you will be greeted with a glass of chilled water and shown out to the tranquil garden area, where loungers are set out around three thermal spring pools. The waters at the spring are some of the hottest naturally occurring waters in the area and consequently have higher concentrations of healing minerals, which are full of health benefits. You can soak up all the goodness and then supplement your experience by having a massage or other spa treatment. The resort offers hotel and villa accommodation as well as yoga classes and various other special health packages. Welcome to the kasbah! At the El Morocco Inn and Spa in Desert Hot Springs you can come and luxuriate in naturally geothermal waters surrounded by opulent Morocco-themed relaxation areas. Besides soaking your cares away in the naturally thermal, mineral-rich waters of the Jacuzzi and pool, you can arrange to be pampered with a range of traditional spa massages and treatments with an emphasis on all things Moroccan. The beautifully decorated rooms at the inn all face the thermal pool and you will be surrounded by rich jewel-colored fabrics and imported Moroccan furnishings to set the scene for a romantic desert hot spring experience. Located in the heart of California’s hot springs mecca, the Hacienda Hot Springs Inn is a boutique-style resort with a relaxed Old World atmosphere that will immediately set the scene for a relaxing break. The pools and lagoon at the Hacienda resort are fed from a naturally heated spring on the property and contain none of the unpleasant odors often associated with thermal springs. To compliment the healing effects of the thermal pools, you can choose from a variety of traditional spa treatments, including massages, detoxifying body wraps, sugar/salt scrubs, and much more. 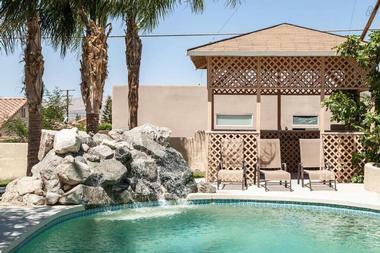 You can enjoy yoga on the lawn, try the Finnish sauna, and cool down under the garden rain shower, all against the backdrop of the scenic San Jacinto Mountains. Located just minutes away from the famous Joshua Tree National Park in the foothills of Desert Hot Springs, the Miracle Springs Resort and Spa promises guests a relaxing and restorative hot spring spa experience. Scenically located against a backdrop of snow-covered Mount Jacinto, you will find a spacious palm-fringed relaxation area containing eight pools that are fed by hot mineral waters that rise up from aquifers located 300 feet below. The water temperature at the source is around 140 degrees and the pools are cooled to around 90 degrees – perfect for soaking and swimming. 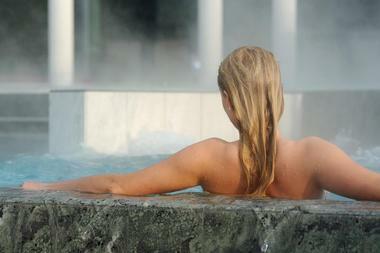 Accommodation, dining, and a full range of therapeutic spa treatments are available on site. The Two Bunch Palms has been pampering visitors for over 70 years – in the 1940s the resort was simply known as The Springs. Today guests can look forward to a serene healing experience when they check into one of the beautiful rooms at this Desert Hot Springs resort. The relaxing and health-boosting hot mineral waters come from the aquifer at Miracle Hill and reach a perfect soaking temperature of about 99 degrees by the time they reach the pools at Two Bunch Palm Resort. You can choose from a range of treatments, which can be taken in the outdoor treatment gazebos, relax in a river rock alcove, and enjoy refreshing outdoor showers. 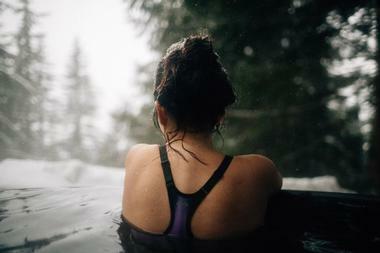 The Mount Baker Hot Springs are located in a very picturesque natural site in the Mount Baker National Forest near Newhalem in Washington. The mineralized hot waters rise from the depths of volcanically active Mount Baker to settle in a natural pool that can be reached on foot along a short trail. 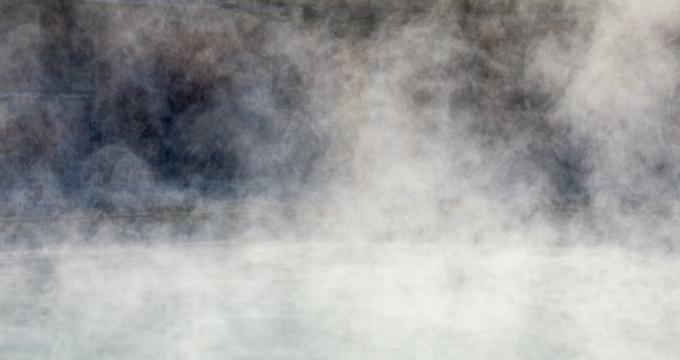 When the waters have been left undisturbed for some time you can often see vapor rising above the pool. The heat of the hot spring varies seasonally and in winter the waters can be quite cool as a result of run-off rain and snow. There are no facilities on site and you will need to bring drinking water and snacks. 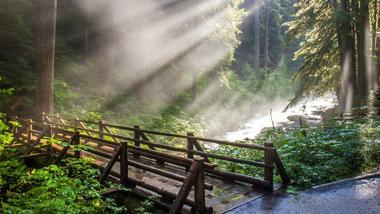 Visitors who would like to try a genuine hot springs experience out in the wilds should consider a visit to the Goldmyer Hot Springs Property in the foothills of the Cascade Mountains near North Bend, Washington. To reach the hot springs, you need to do some planning, including making a reservation well in advance, as only 20 visitors per day are allowed onto the property. There are three tiered baths, which are naturally filled with hot, mineral-rich waters; they are quite small and the uppermost bath is partially inside a cave, which becomes very hot and steamy – just like a natural sauna. You have to access the springs on foot along a fairly level 4.5-mile hiking trail and you will also need a high-clearance vehicle to reach the trailhead. Camping is allowed but you will need to carry in everything you need. The Olympic Hot Springs are a series of around 21 hot thermal seeps that occur naturally in the Olympic National Park in Washington. The various pools are definitely not for swimming – you can expect to find shallow, mud-floored pools that will only reach around waist height when you are seated. You can access the pools by hiking the fairly easy 2.5-mile Appleton Pass Trail in summer, but in winter road closures can add at least another 4 miles to your hike. 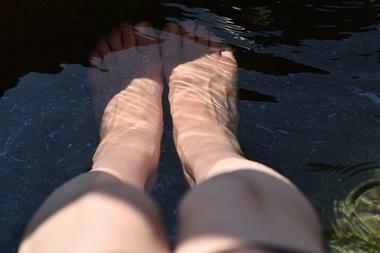 The temperature of the pools varies from lukewarm to hot. Unfortunately, the pools are not regularly cleaned or maintained and the sign at the trailhead warns visitors to bathe at their own risk due to the possible presence of bacteria, especially during summer when there is little or no natural flushing. Scenic Hot Springs is a privately owned natural thermal spring located close to the Alpine Lakes Wilderness in Washington. At one time the springs were a popular destination for wealthy visitors from Seattle, who used the Great Northern Railway to access a lodge known as Madison Hot Springs Hotel. For many years the springs were virtually forgotten and were closed to the public in 2001. The good news for all nature lovers is that a new owner is allowing limited access to the very scenic springs – you have to apply on-line for permission to visit and there are no facilities; in addition you face a steep up-hill hike to reach the springs. 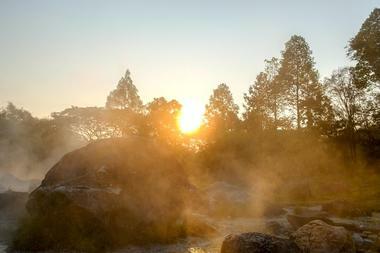 If you think you will love the chance to bathe in the wilderness, you can follow the link below for more information. 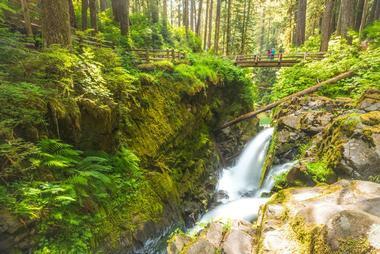 Located in the heart of the Olympic National Park and Forest, the Sol Duc Hot Springs Resort is an ideal place to spend a few days enjoying the mineral-rich thermal waters of the Sol Duc Springs and exploring the many other attractions of the national park. The resort has three pools fed by the thermal springs – temperatures vary from around 99 to 101 degrees – as well as a refreshingly cool freshwater pool. After a busy day exploring the surrounding forests and waterfalls along a variety of hiking and biking trails, you can soothe your aching muscles in the restorative hot pools and have a relaxing massage before you retire to your rustic cabin set in the forest. 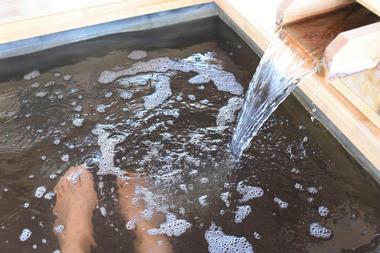 For hundreds of years, people will all kinds of aches and ailments have been coming to Truth or Consequences in Sierra County New Mexico to see for themselves if the mineral-rich hot waters have magical restorative properties. 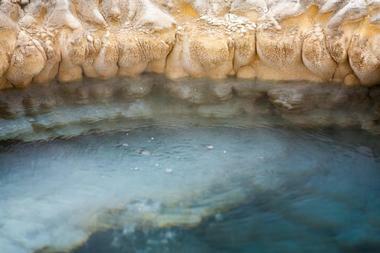 The hot springs in Truth or Consequences are unique in that they have the highest concentrations of mineral found anywhere in the country and lack the unpleasant smell so often associated with hot thermal waters. Today you can visit the spas in the Hot Springs Bathhouse Historic and Commercial District, where quaint restored hotels and guesthouses provide accommodation and a variety of health therapists are on hand to offer treatments.